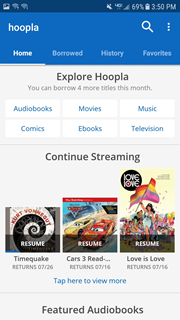 Borrow up to 5 items per month: movies, music, audiobooks, ebooks, comics and TV. Titles can be streamed immediately, or downloaded to phones or tablets to enjoy later. 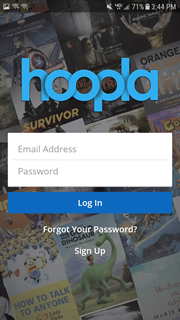 With hoopla the Public Library comes to you! Open and log in with established account, or click the Sign Up link below the log in fields. 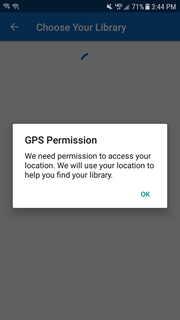 The app will ask for GPS Permission to access your location so it can quickly determine your library. Across the top of the screen are Home, Borrowed, Favorites, History, and Favorites, and below that are the number of remaining checkouts for the month. Choose from media types or scroll down to see featured titles. Click on any item to see more details, add as a Favorite, or checkout. 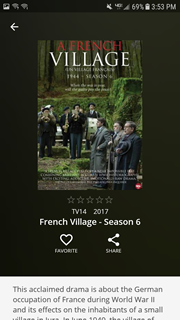 For television shows, scroll down to see episodes available for checkout. Unfortunately, samples are not available for titles on hoopla. To borrow a title, click on the blue Borrow button. Your borrowed titles can be played right after borrowing! Use the app to download titles for viewing or listening while you're out of WiFi range. Simply click the blue Read button after checkout and the title will download to your device. To edit email address, update your library card, PIN, or change your password, use Settings using the hamburger n the upper-right hand corner of the page. Also, this is where users can turn on Kid's Mode and edit what recommended titles they would like to see when visiting the site. If you change the PIN on your Library Card you need to come here, go to Library Settings, and then update the saved PIN with your new PIN which is saved with your Library Card number here.